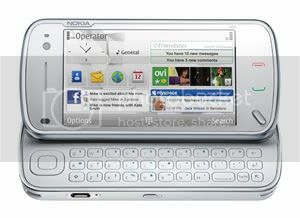 The Nokia N97 is Nokia’s first device to feature a personalizable home screen, which can be customized with a range of widgets which bring live information directly to the device. These widgets include key social networking destinations like Facebook and Hi5, news services like the Associated Press, Bloomberg and Reuters, as well as shopping and weather information. The Nokia N97 is the first device to ship with the Ovi Store, which offers easy access to applications, games, videos, podcasts, productivity tools, web and location-based services, and much more. Ovi Store has paid and free content from a range of global and local content providers and developers, including Paramount Pictures, Facebook and Qik, as well as a selection of Twitter applications. The beauty of this Nokia device is that taking it out of the box is just the beginning. As with any computer, people can constantly improve and refresh their Nokia N97 with new features, functions and fixes so they can do even more with the device. An exciting roadmap of new features and functions is planned to roll out in the second half of 2009.